To complement this year’s Brass Band Festival at the Royal Northern College of Music, we’ve been playing recordings from some of the UK’s many brass bands. Mainstream British composers have always relished the challenge of writing test pieces for the unique sound and technical prowess of brass bands. Here, in superb recordings, are three of the best pieces ever written, by Malcolm Arnold, Edward Elgar and Herbert Howells. Little Suite No.1 for Brass Band by Malcolm Arnold played by Grimethorpe Colliery band. Malcolm Arnold's delightful Little Suite No.1 was commissioned by the Scottish Amateur Music Association for the National Youth Brass Band of Scotland in 1963. Arnold later remarked, "I am certain that such an organisation as a Youth Brass Band not only does so much good for talented young musicians, but its influence will be far larger in a social sense, than only a musical one." Elgar's Severn Suite in a famous recording with Black Dyke Band conducted by Colin Davis. In 2008, Black Dyke Band invited the veteran orchestral and opera conductor Sir Colin Davis to make a recording of Elgar's Severn Suite, which the composer wrote in 1930 in response to an invitation to write a test piece for the National Brass Band Championship. "The whole event, with journalists in tow, was presented as a meeting of worlds, and LSO trumpeter and ex-bandsman Rod Franks was on hand as a 'translator', keeping Sir Colin up to speed with band conventions, with suggestions on how he might get the best out of them in terms of colour and technique. The standard was phenomenal, right from the first run-through, and bandsman Duncan Beckley said at the time: 'Davis very quickly adjusted to them – the band was also learning some of his more subtle gestures. We’re so used to conductors also being trainers that this level of pure conducting is a rarity in our world." Howells's Pageantry is conducted by David King with the Yorkshire Building Society Band. Herbert Howells's 1934 British Open Championships test piece, Pageantry, is conducted by David King with the Yorkshire Building Society Band. In 1995, the piece was controversially revised by composer Philip Wilby to upgrade the percussion part, making it compatible with modern brass brass competition requirements. 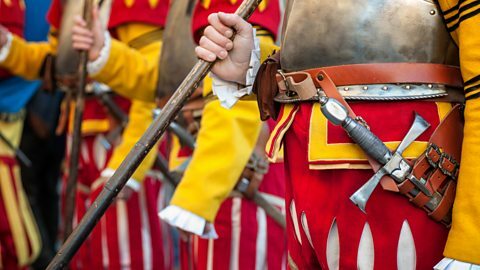 The music needs little introduction beyond the title, Pageantry, with its flavour of medieval jousting, grand parades and flag-waving. It's in three movements: I) King's Herald; II) Cortege; III) Jousts. The piece was heard again at the Championship Finals at Alexandra Palace in 1937. Howells remarked: "A composer may count with certainty on only a few superlative performances of a work in a lifetime. On Saturday I heard half a dozen in one afternoon!" 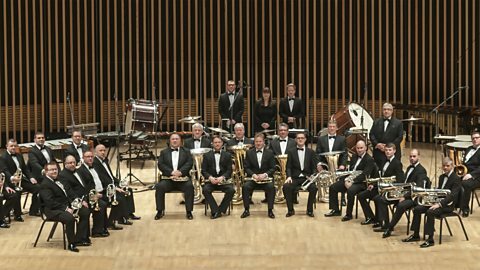 Listen to a concert from the Brass Band Festival at the Royal Northern College of Music. Donald Macleod pays tribute to the composer who died in 2006. 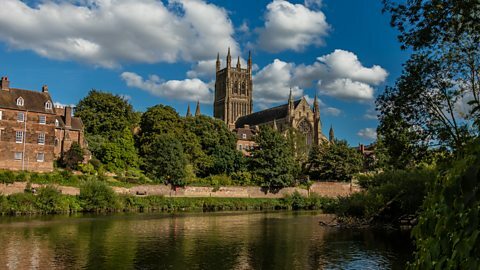 Listen to programmes examining the life and works of Edward Elgar. Donald Macleod maps Howells's compositional roots, from an unprivileged Gloucestershire upbringing back to the music of the Tudors.